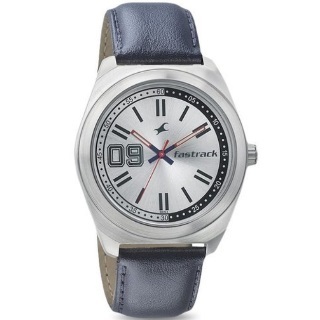 TataCliq Sale - Purchase Fastrack 3174SL01 Varsity Analog Watch for Men worth Rs.1650. This men's analog watch from Fastrack's Varsity collection is a must-have. Protected by mineral glass, the silver round dial exhibits plain three hands and stick markers that facilitate reading ease. Crafted from premium quality genuine leather, the strap showcases a navy shade that elevates its look. No coupon code required. Shop now!